Sock monkeys were traditionally fashioned from old socks by mothers in the American depression. Now they appear globally and Alexandria Isaacson imagines them plotting with their deviant button eyes to reclaim the fast moving culture of store bought toys and replace it with the individuality of the handmade. This exhibition presents a range of Isaacson’s sock monkey creations that fill and threaten to take over the artist’s imagination. 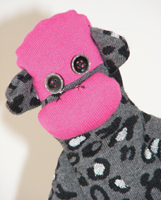 Image: Alexandria Isaacson, Pink and grey spotted monkey (detail) 2009, socks, synthetic stuffing, buttons and thread. Courtesy of the artist.